The U.S. Laser National Championships and U.S. Singlehanded Championships brought over 100 sailboats to Lake Tahoe â the most competition the lake has seen in decades. Lake Tahoe’s blue waters near Tahoe City were turned into a sea of white sails as nearly 100 International Laser Class sailboats jibed and tacked their way in a four-day battle for the U.S. Laser National Championships and U.S. Singlehanded Championships. 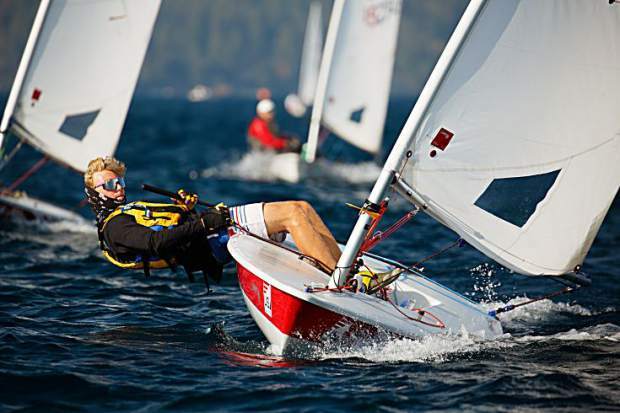 The Tahoe Yacht Club hosted the championships for the first time in its history, marking the most prestigious event the club has put on, and also, according to Laser Fleet Captain and Tahoe Yacht Club Commodore Rick Raduziner, was the largest sailing competition on the lake in several decades. “Last time something like that happened was 40 years ago with the Trans Tahoe,” Raduziner said. “It’s a big deal for sailing and the Tahoe Yacht Club. We’re a small club, the big clubs in the country typically host events like this. The U.S. Laser National Championships ran in conjunction with the U.S. Singlehanded Championships on July 20-23, and brought together some of the top sailing talent from around the country and Canada. The championships were contested in single-man Laser Class sailboats, which were divided into Laser and Laser Radial (smaller sail area) classes. The Singlehanded Championships were awarded to the top three men in the Laser division and the top three women in the Laser Radial division. The yacht club was awarded the two championship events several months ago, according to Regatta Chair Erica Mattson, leaving the club little time to put together an event that usually takes a year’s worth of preparation. Marek Zaleski, sailing out of Noroton Yacht Club in Darien, Conn., took first-place in two of three Laser races on Thursday, July 20, and a fifth place in the other. He’d go on to sweep three contests on Friday, July 21, to hold a commanding lead over the 38 other sailors going into the weekend. A lack of wind on Saturday afternoon, July 22, brought racing to a halt, leaving only Sunday, July 23, for racers to make up ground in the Laser and Laser Radial divisions. The conditions would improve enough on Sunday to allow for a final race in each division. Zaleski would finish in seventh place in the finale, but because the sailors’ worst finish out of the seven races was removed from the scoring total, Zaleski took home the championship with a low-score of 10 points. Zaleski has stated he will be training to make the U.S. Olympic sailing team, and will be racing in Croatia for the World Championships in September. Jake Vickers, who represented Severn Sailing Association out of Annapolis, Mary., finished in second place with 16 points. Vickers finished in the top-five in six of the seven races, including a first-place finish in the final race of the series. William Pullen was Tahoe Yacht Club’s top finisher with 70 points for 12th place. Pullen’s best performances came in the third and fourth races of the series where he took third- and fourth-place finishes, respectively. The smaller-sailed Laser Radial division was able to get six races in over three days of competition. Chase Carraway out of Carolina Yacht Club and Lauderdale Yacht Club, took the national championship over 52 other sailors with top-five finishes in five races for a low-score of 12 points. Carraway won two of the races during the series. Hanne Weaver out of Gig Harbor, Wash., was second overall with 31 points, and was the top finishing female. Weaver’s performance during the competition also landed her the overall Women’s U.S. Singlehanded Championship. Joseph Hou out of California’s Newport Harbor Yacht Club finished in third place. Hilary Davis was the Tahoe Yacht Club’s top finisher. Peter Edwards, who sails for the Tahoe Yacht Club out of Nevada City, was given the Peter J. Barrett Sportsmanship trophy, said Mattson, for his effort in demonstrating sportsmanship after his boat capsized resulting in a collision with a pair of sailors. For complete results visit regattanetwork.com/event/14186#_newsroom.